What causes pimples to appear? How to heal acne scab quickly? Pimple scabs also known as acne scab is a red and sore formation that form after popping a pimple. Scabs appear in red, brown and even black color. Crusty scabs form usually on wounds or cuts to help healing. After scratching, dry crusty scabs form on the pimple’s head. They can keep scabbing over and over to yellowish and come off too early sometimes. Pimples or medically known as acne is a type of inflammatory disease that can be caused by a multitude of factors. It primarily affects the pilosebaceous follicles. Usually, acne appears if there is an abnormal desquamation of the keratinocytes lining the sebaceous follicle thereby creating a microplug. The acne can range from small patches of red skin with small bumps to large cysts that are painful to touch. There are various types of acne and each have different underlying causes. 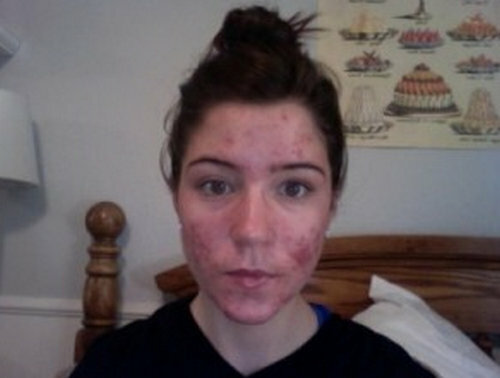 Understanding precisely what type of acne you have can help in identifying the type of treatment you are going to use. Type 1 acne – There is a minimal inflammation on the affected area. There is no associated pain and irregular outbreak. 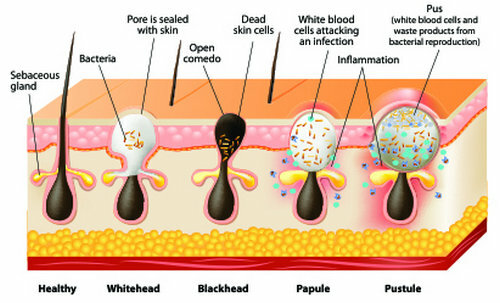 Type 2 acne – It is characterized by mild inflammation and pain. The person will experience a regular outbreak. Type 3 acne – There is a moderate inflammation. The pimples are painful even when not touch. They are also filled with pus. Regular outbreak will be experienced by the patient. How to make pimple scab go away at home? Here are important practices you should consider to get rid of pimple scabs fast and naturally at home. Apply baking soda gently on the infected area daily. Mix with water to make a paste. Let it dry for 3-5 minutes. It helps by killing bacteria and fungus. Cleanse your face using antibacterial soap (sulfur). This is useful in drying excessive oil, exfoliating dead skin cells, and get rid of bacteria on the surface of the skin. It can help deliquesce both blackheads and whiteheads and lessen hyperpigmentation caused by acne scars. Put on moisturizer. Moisturized and intact skin is your body’s greatest defense against harmful microorganisms because it is a naturally occlusive barrier that retains moisture in and infectious agents out. Drinks plenty of water, ideally 10-12 glasses per day. Vitamin E oil applied topically will help remove the scab and lighten the scar. Eat nutritious foods regularly. Avoid oily foods and junk foods. Pimple scabs can make you unconfident and uncomfortable with the way you look. Acne can be awkward and annoying for people so it’s a must to get rid of them fast and naturally so they won’t leave scars. To restore your skin to good health, you must religiously take good care of your skin and overall health and well-being. A lot of us tend to pick at our skin, especially in areas where blemishes, pimples, scabs or bug bites are noticeable. However, this behaviour can lead to worsening of the condition. It can actually cause widespread scarring and noticeable wounds on the skin. The scars and lesions become prominent, which will surely affect one’s self-confidence and self-esteem. Those who have severe acne breakout and severe pimple scab avoid going out in public because they fear of being judged by other people. They try to do everything they possibly can to conceal the scab. They would resort to wearing tight clothing such as long sleeves and would cover up the scab with heavy makeup. Fortunately, there is no existing medical procedures in removing pimple scab but most scars are highly treatable. The dermatologist can used various treatments for the scar but it basically depends on the factor that causes scar formation. Dermatologists are expert that can support you for the treatment of skin diseases. Although scars are a natural part of the skin’s healing process, they can cause pain, inconvenience, and self-consciousness. Small scars are barely difficult to notice, especially if given enough time to heal. Huge thick, raised, and indented scar need medical treatment to somehow reduce its appearance.